As part of our “Release Early and Release Often” mantra here at Ziflow, we’ve recently added in some new capabilities to make it even easier to use Ziflow online proofing with team members (internal and external) to collaborate on the review and approval of creative projects. In our most recent release, we’ve added a new section in the interface called People. 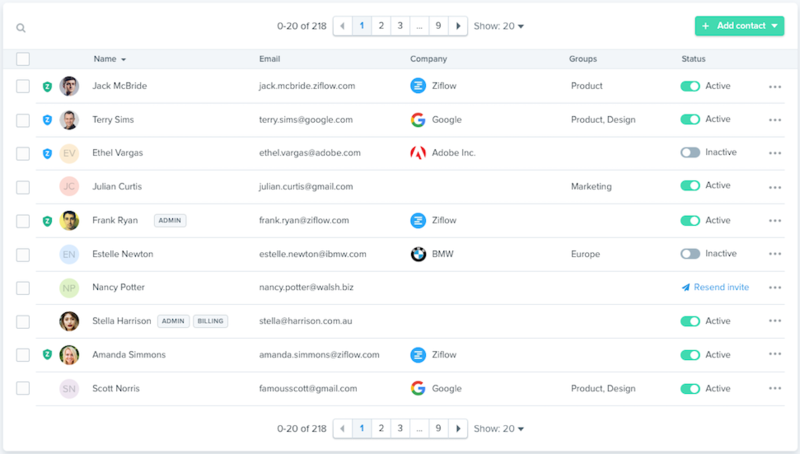 It’s in this section where Ziflow users can quickly see a view of all the Users, Guests and Groups associated with your account. This new view provides the easiest method for adding in new users or guests who will be frequently contributing to the review and approval process. It also provides a one-click method for adding team members to Groups (see more on that below), or to remind them on late proofs. The People view also lets you quickly navigate to a set predefined filters, allowing you to see all contacts across accounts, users in your account, users who are also in other Ziflow accounts, as well as guests that you or others have invited. If your organization has teams which often work together on projects, the new Groups capabilities will save you time, as well as help ensure that no team member gets left behind in the review process. For example, an agency might have a dedicated designer, project manager and account manager for a specific client. They each could be added to a Group which would then be easily added for new proofs (or proof versions) for that client. Team members can be members of more than one Group as well. Once you’ve created a Group, you can then easily add them to new or existing proofs. Group members can have unique notification settings as well, keeping updates to an appropriate frequency for team members. Creating Groups is as easy as naming the group, adding in team members and deciding on how often you wish to have them updated on a proof’s progress. Groups make it easy for you to select review teams to share items with in just one click. When you're creating a new proof (or a new version), you can select a group to share the proof with by typing the name of the group into the share field. You can also start typing a group name and a list of suggestions will show up as a list in the drop-down. 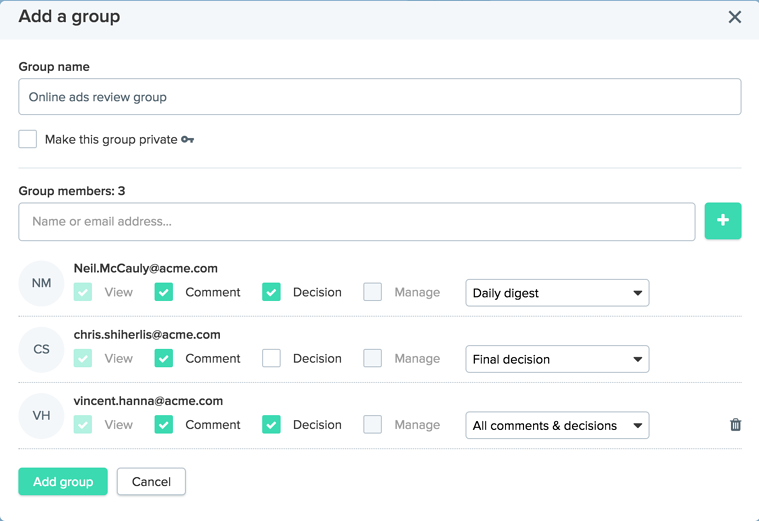 This new user management capability is just one of many features that we’ve added in since our launch. To be kept up to date on all the new capabilities being added to Ziflow each week, be sure to sign up for our blog below.